Q: What courses are offered in jazz? Q: How many Jazz Ensembles are there at Ithaca College? Q: Can non-jazz majors or non-music majors participate in the jazz program? Q: Do jazz studies majors get private jazz instruction on their instrument/voice? Q: If I were to major in jazz studies, would I be required to study classical music? Q: I want to be a jazz studies major, but I want to primarily study a less common jazz instrument. Can I do that? Q: Would I be permitted to double major in Jazz Studies and something else? Q: Is there a jazz studies minor at Ithaca College? Q: I do not want to major in jazz, but I do want to participate in jazz at IC. When I audition for the school, should I also take a jazz audition? Q: Does Ithaca allow students to obtain a music education or performance degree through studying a jazz instrument instead of a classical one? Q: Who teaches jazz at Ithaca College? For more information about the courses in the jazz studies major, please see the online course catalog. A: Currently there are three full-size big bands, numerous faculty-coached small jazz combos, and a vocal jazz ensemble. A: Yes. Placement into any of the IC jazz ensembles is based on an audition at the beginning of the year, open to all IC students regardless of major. Quite often, music minors and non-music majors who are dedicated to studying jazz are placed into the jazz ensembles, even including the premier jazz performing group, the Ithaca College Jazz Ensemble. In addition, the jazz studies courses are available to any Ithaca College student regardless of their major. 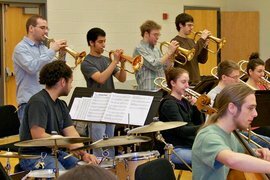 Jazz classes are routinely taken by students of almost every major, including music education, composition, performance, theory, jazz, and other music majors as well as non-music majors. Several jazz courses do have prerequisites, of course; Jazz Theory and Aural Training requires a student to have taken (or passed out of) Fundamentals of Music Theory. Subsequently, Jazz Theory and Aural Training is then the prerequisite for the Jazz Arranging and Jazz Standards and Literature sequences. A: Yes. Jazz Studies majors actually receive private lessons in both classical and jazz simultaneously. They receive two 30-minute lessons per week: one jazz and one classical. In some cases, the classical and jazz teachers are the same person. For example, bassists would get both jazz and classical lessons with bass professor Nicholas Walker. 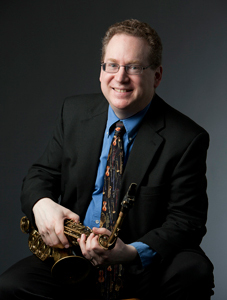 Saxophonists, however, would get weekly 30 minute classical lessons with world-renown saxophone professor Steve Mauk, and 30-minute jazz lessons with jazz saxophone teacher (and Jazz Studies director) Mike Titlebaum. Because of the equal importance placed on the study of classical music and jazz within the jazz program, prospective jazz studies majors actually audition TWICE on their chosen audition day; once with the classical performance faculty, and separately on jazz along with a live rhythm section. For more information on what material to prepare for auditioning for the jazz studies major, please see the Requirements per Instrument page and the list of songs for Jazz Studies Majors. For more information about the specific sequence of courses in the jazz studies major, please see the online course catalog. A: Yes. It is the firm belief at the Ithaca College School of Music that the study of classical music provides a solid musical foundation essential to becoming a well-rounded jazz musician, both in terms of instrumental/vocal technique, and in terms of essential knowledge of harmony, melody, rhythm and form. This breadth of knowledge also provides aspiring jazz musicians with the greatest chance for success in a musical career. Therefore, the jazz studies program at Ithaca College gives equal importance to a the study of both jazz and classical music. That means that while all jazz studies majors vigorously study jazz (private jazz lessons, jazz theory and aural training, jazz arranging, jazz history, jazz ensemble, jazz combos, jazz repertoire and pedagogy, jazz standards and literature), they also must complete all the same core music courses as all other music majors: theory, sight-singing, history, private classical lessons, and classical rep class and music technology amongst others. Because of the equal importance placed on the study of classical music and jazz within the jazz program, prospective jazz studies majors actually audition twice on their chosen audition day: once with the classical performance faculty, and separately on jazz along with a live rhythm section. A: Not at the current time. Currently, the only instruments you can choose as primary instruments for jazz studies majors are saxophone, trumpet, trombone, bass, piano, drums/percussion, guitar and voice. However, students who sing or play any instrument can take the entire suite of jazz studies classes. Singers, flautists, violinists, cellists and many other instrumentalists routinely take various jazz classes. In addition, students are strongly encouraged to play instruments other than their primary one. In fact, all of the current members of the IC Jazz Ensemble saxophone section are called on to play many instruments in the band, including saxophone, clarinet and flute. And for some, clarinet is their primary instrument. A: Double majors are possible. However many students underestimate the intensity and time commitment required of all the individual music degree programs at Ithaca. Any single music major requires many weekly hours of concentrated practice and study, plus a significant amount of extra time on weekends and during school vacations. Double majoring in performance and jazz studies should not generally be necessary since the jazz major is quite similar to a performance degree (including 60 minutes of private lessons per week) but with a strong emphasis in jazz. Additionally, almost all of the jazz courses are available to students regardless of their major. Many music ed. students take jazz theory, rep class, arranging, history, pedagogy, and play in the jazz ensembles and combos, as do students in many other music degree programs. Therefore, double majoring with jazz studies is not a frequent occurrence. A: At the present time, there is no jazz studies minor. However, a concentration in jazz studies is now available to music majors at Ithaca. See the catalog for more details. Additionally, the jazz studies courses are available to any Ithaca College student regardless of their major. Jazz classes are routinely taken by (and jazz ensembles staffed by) students of almost every major, including music education, composition, performance, theory, jazz, and other music majors as well as non-music majors. Several jazz courses do have pre-requisites, of course; Jazz Theory and Aural Training requires a student to have taken (or passed out of) Fundamentals of Music Theory. Subsequently, Jazz Theory and Aural Training is then the prerequisite for the Jazz Arranging and Jazz Standards and Literature sequences. A: No. The only people required to take a jazz audition (in addition to a classical audition) on IC audition days are those students seeking to major in jazz studies. All other prospective music majors take the single classical audition for admittance into the IC School of Music. Once you choose to attend Ithaca College, you can audition for the jazz ensembles at the beginning of the fall term. You would also be permitted to enroll in the jazz courses. Several jazz courses do have prerequisites, of course; Jazz Theory and Aural Training requires a student to have taken (or passed out of) Fundamentals of Music Theory. Subsequently, Jazz Theory and Aural Training is then the prerequisite for the Jazz Arranging and Jazz Standards and Literature sequences. A: It is not possible to replace classical lessons with jazz lessons. We believe strongly in the value of the classical and fundamental education. However, as long as a jazz faculty member in your instrument or voice has load room, you would be able to take secondary lessons on jazz. As a secondary lesson it would have an additional fee attached, though. The only degree program at Ithaca College that contains primary jazz lessons is Jazz Studies. For more information about the specific sequence of courses in the jazz studies major, please see the online course catalog. Mike Titlebaum, director of jazz studies. Jazz saxophone, ensemble, history, theory, arranging, standards and repertoire classes. Greg Evans, jazz drums, jazz lab ensemble, combos, jazz history. Nick Weiser, jazz piano and standards and literature. Bill Tiberio, jazz lab ensemble. Dr. Nicholas Walker, bass, combos. Were your questions not answered here? Please feel free to contact Mike Titlebaum, director of jazz studies at mtitlebaum@ithaca.edu.